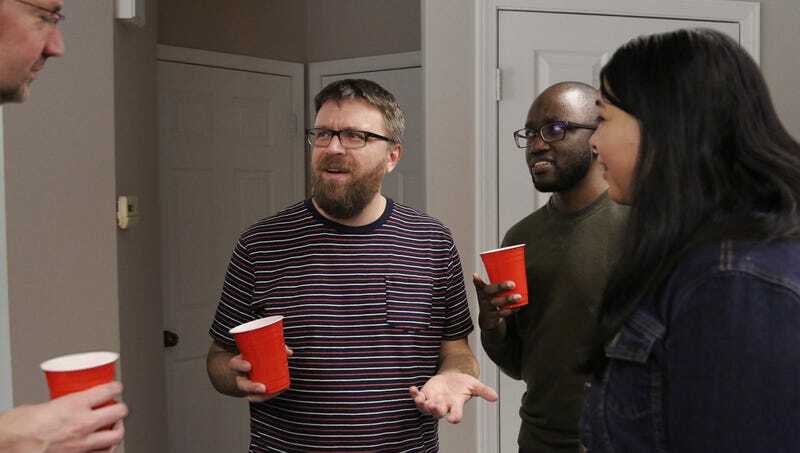 SAN JOSE, CA—Upon suddenly realizing none of them knew the origin of the current conversational subject, a determined circle of friends on Tuesday diligently traced back how their discourse arrived at the topic. “I remember we were talking about Ed Harris and how he’s in The Truman Show, but how did Connecticut come up?” 39-year-old Taylor Clark asked a group of focused friends, whose intensive review of the exchange revealed they had listed their favorite sci-fi movies, which led to a discussion of the space program and, from there, dream jobs, NASCAR, and which members of the group enjoyed driving. “Johnny brought up lunch with his parents, which reminded us of the deli scene in When Harry Met Sally, but I’m uncertain how we started talking about our families in the first place...Gracie had a tangent about vacations and Zach mentioned going back to Boston for his birthday, which inspired my story about clowns, but weren’t we also talking about cooking at one point?” At press time, the forensic investigation had been derailed by a discussion of favorite childhood meals.